Smiling men and women of diverse races, ages and sizes fill the stage at the Wertheim Performing Arts Center. They begin their song. It’s a spiritual, and they start to clap their hands and move their feet as they join in praise for the glory of God. “That’s right!” says a woman in the first row of the audience as she rises to her feet to clap along. Choir members snap their fingers and groove from side to side, following the lead of their director. Their voices crescendo, giving way to a soprano who takes center stage and belts out a solo. The crowd is dancing, energized and electrified. They haven’t seen anything like this at FIU before. This is FIUnity’s inaugural performance. Just five months ago, the university did not have a gospel choir. Now, FIUnity, an open-membership gospel choir, stands 35 members strong. Leading the gospel: FIUnity director Terence Clayton addresses the audience at the Wertheim Performing Arts Center. The group’s first concert at the Wertheim Performing Arts Center in April drew nearly 500 people. 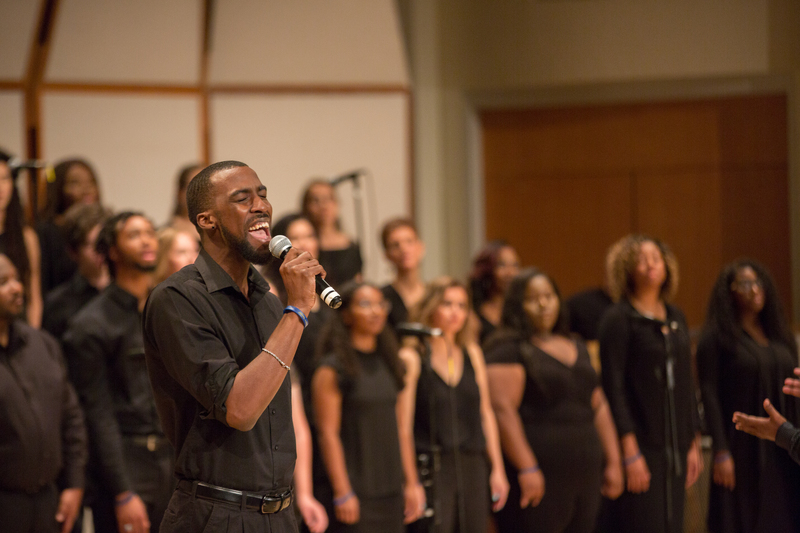 After hosting a handful of successful impromptu performances and public rehearsals in the spring, they are successfully bringing the message and soul of gospel music to the university community. School of Music choral director Kathryn Longo for almost two years thought about starting a gospel choir. 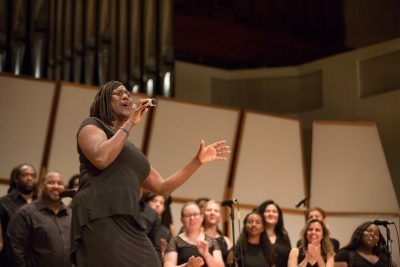 Today, FIUnity choir is offered as a course for credit for current students, and open to faculty, staff, Miami Dade College students and anyone else in the community who is interested–no prior singing experience required. “It’s important to me that this was part of the School of Music. The influence of gospel is really important in jazz, spirituals, rhythm and blues,” Longo says. “Gospel is oral tradition. This is the roots of American tradition that grew out of the slave tradition as work and spiritual song. There was no need to write it down. This isn’t Mozart composing a symphony and writing it all down on paper,” Longo says. Elish Martin, a 19-year-old music performance major in double bass string studies, discovered FIUnity after hearing a public rehearsal in the Graham Center pit. Longo encouraged him to come to a rehearsal. Business Services Director Finance Felecia Townsend ’91, MS ’98, a soloist and a soprano in FIUnity, has been an advocate for gospel on campus since she was a student. In 2003, she founded Voices of Unity, a choir that performed on campus for several years. “It is like a breath of fresh air that it is reborn, rebranded and embraced by the School of Music,” Townsend says. Sing it out: Felecia Townsend stars as the first soloist of the night at FIUnity’s spring concert. She is also not the only Townsend in the group. Her son Daniel sings tenor. They both featured as soloists in April’s concert. “Growing up with a mom who is always singing is crazy. She can start singing and I’ll just kind of chime in. We’ll know exactly where each other is going with the song. It’s become like muscle memory for both of us,” he says. Although gospel music is normally heard in churches, FIUnity appeals to people of a variety of backgrounds. That is part of the appeal for Stephanie Doscher, director of Global Learning Initiatives. 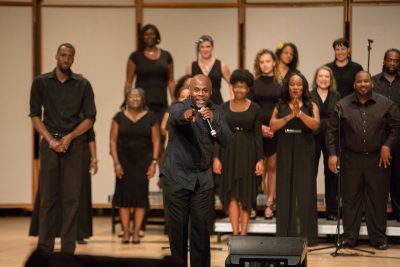 Choir director Terence Clayton comes to FIU with an extensive background in music. He has studied music at multiple universities, worked with churches and released gospel works of his own. His debut album, Breathe On The Nations, was released in 2013 with the single “Nobody Like Our God” making it to No. 35 on the Billboard gospel chart. Clayton and Longo were put in touch by a mutual colleague at Miami Dade College in the fall of 2017. Their mutual appreciation for gospel made FIUnity a reality. “I feel like I’ve known Kate for years, and I just met her. She understands the diversity of the arts and that gospel is legitimate. Sometimes in choral music, gospel has been looked at and viewed as not being a legitimate style when in fact it is. She said she wanted people to experience it and she knew what I could bring to the table,” Clayton says. Members of the choir attribute their success to Clayton’s positive teaching style. “Terence is very kind about how he words what he’s trying to say. It’s how he instructs us that brings the group together. Everyone encourages each other. I’ve been in groups where there’s a consistent competition and it goes on and on and it never ends, but this group is not like that. It’s a good kind of competition,” Martin says. Daniel Townsend, Felecia’s son, follows his mom as the second soloist of the night at FIUnity’s inaugural concert. Clayton traces the roots of his positive approach to musical instruction back to his childhood. “I experienced a lot of criticism growing up and being in music. At that time, it wasn’t the most masculine thing to do. I started taking piano lessons when I was seven, and my mom told me at the time that if I started, I wouldn’t stop until I’m 18. She meant that,” he says. FIUnity is looking to expand next fall. In addition to impromptu performances on campus, they are welcoming new members and will host a holiday-themed show in the winter. To contact FIUnity, email fiunitygospelchoir@gmail.com. They can also be reached through their Facebook page, and on Instagram.